The Opinaca Gold West project covering 110 km2 is 100% owned. It lies approximately 40 km west of the Éléonore mine and is situated along the same geological formation as the mine. The project covers a series of geochemical gold-arsenic anomalies and geological elements that suggests the presence of a mineralized system along approximately a distance of approximately 40 km. 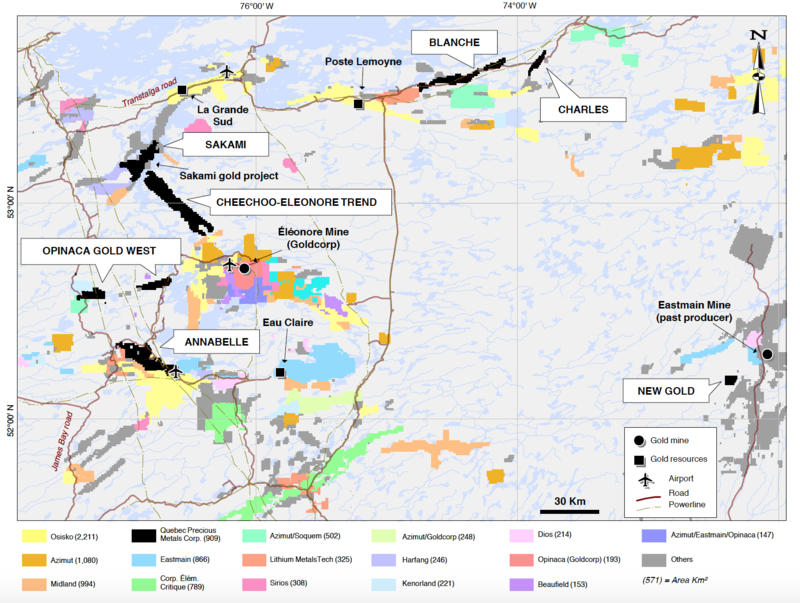 QPM has assembled a district-scale land package (909 km2) in the underexplored region of the Eeyou Istchee James Bay territory in northern Quebec located near the town of Radisson. The region hosts the Éléonore gold mine discovered by Virginia Gold Mines in 2004 and operated by Goldcorp Inc. since 2014. The flagship project is Sakami and QPM is advancing it to the resource estimate stage by the end of 2019. Existing infrastructure facilitates exploration at a reasonable cost all year round.